Not long ago, my wife, Patti, and I visited Caesarea Maritima in Israel, an ancient ruin of a city built by Herod the Great around 12 B.C.E. Before Herod took control of it, Caesarea was nothing more than a small fishing village, but he built it into a center of trade, politics, and power. Caesarea became the administrative capitol for Pontius Pilate and the home of the tenth Roman legion. In that place, Herod managed to build one of the largest man-made sea ports ever built in a place that had no natural harbor. But in order to turn a small fishing village into a bustling, powerhouse of a city, Caesarea needed water. .. a lot of it. And so, Herod built an aqueduct that would carry water to the city from the mountains more than 7 kilometers (about 4 miles) away. In some places the aqueduct ran underground, in others above it, and in places where they needed to maintain its height, it ran in an elevated channel that was supported by enormous stone arches. 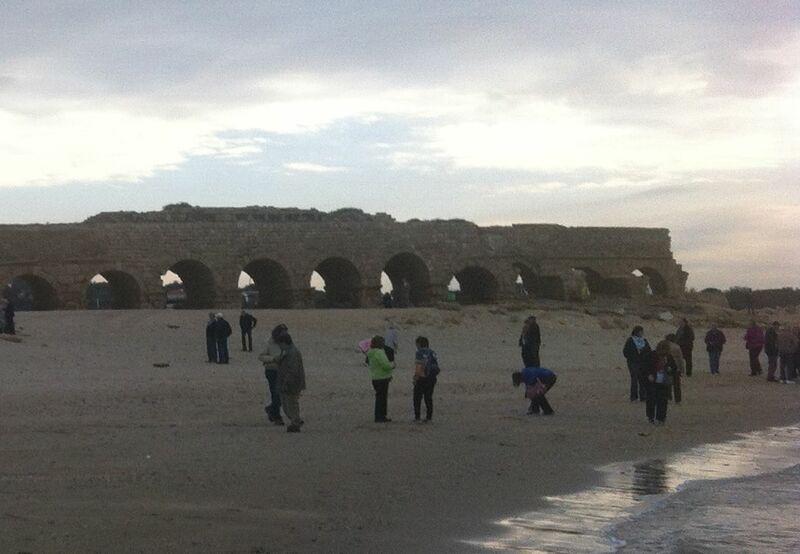 As we visited Caesarea, we could still see it on the beach outside of town. Herod’s aqueduct was used for over a thousand years, and although it was repaired and rebuilt several times, what is seen to day is nothing more than a dry and empty ruin. Even as a ruin, it is still imposing and impressive. But as impressive as it is, Herod’s aqueduct is useless. As I looked at this massive structure, I was reminded of a story that I read a number of years ago which asked whether our lives were intended to be pools or channels. The answer is given to us by none other that Jesus in John chapter 15 where he said, “I am the vine; you are the branches. If you remain in me and I in you, you will bear much fruit; apart from me you can do nothing.” What Jesus tells us, is that our function as followers is to be a channel that carries his strength from the source to the fruit. We aren’t the roots and we aren’t the grapes. We are the branches. And so it is with the aqueduct. Our calling is not to receive God’s message, his Spirit, and his power and store it for later. We aren’t meant to be dams, lakes or reservoirs. Instead, our job is to be like streams, rivers or the aqueduct. We are meant to be channels through which God’s grace, mercy, love and strength can flow into the lives of others. But too many of us look just like the aqueduct in Caesarea… dry, useless, and empty. We remember better days when we were once filled to overflowing, but somewhere along the line we became disconnected from the source. Rivers are powerful because they are connected to the source of their strength in the mountains. Herod’s aqueduct was useful because it carried water from mountain springs to a thirsty city. But disconnected from the source, rivers and aqueducts are nothing more than dry relics of a better day. The only way that they can do what they were intended to do is for them to remain connected to the source. The same is true of us. Whether we think of ourselves as branches or aqueducts, our role is the same. Our mission is to carry the message and power of Jesus Christ to a world that is desperately thirsty. But the only way we can is for us to keep drinking from the spring. When we think that we’ve had enough, learned enough, studied enough, or done enough and we stop drinking from the source, we become disconnected, dry, and useless. The world still needs the mercy, forgiveness, compassion, strength, and love of Jesus. …is for us to stay connected to the source. Sign up now to receive email notification for updates to the Crossfusion blog, click here.